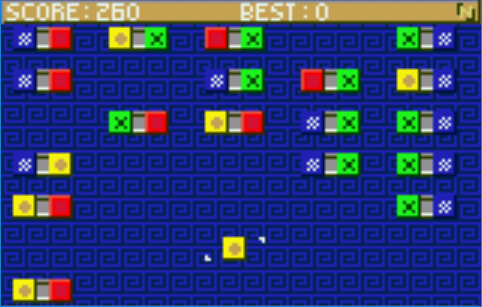 Biniax is open-source puzzle game by Jordan Tuzsuzov, originally written for Microsoft Windows and Linux, but later ported to tens of other platforms by different nice people around the World. The game play is extremely simple – move around your block and clean your way ahead. Biniax was my first experiment at porting a game to the Atari Lynx, startet in november 2018. I halted the game developement after having a basic playable version (posted in the Developement section) and moved to work on other things. But few days ago decided to cleanup the port and make a final release. This port is of the v1.2 of the original game. 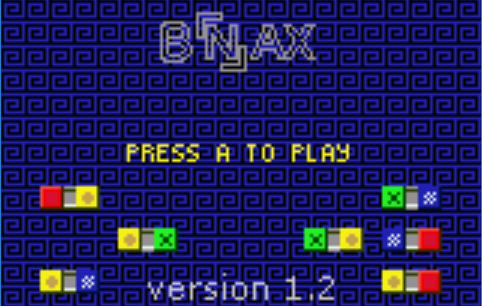 There is a Biniax v2 with improved gamelay and a 2 players mode that will be very nice on Lynx with Comlynx. Probably in the future I'll try a port of the v2 too, mainly to study the use of the comlynx. Meanwhile I hope you'll enjoy this small puzzle game. Thanks very much for creating this game and sharing it with the source code. Much appreciated. Will play it today. Nice addition to the Lynx library. Thanks. Looking forward to updates, and awesome that you posted the source - a great learning tool! That's great, I played the earlier version and this is much better. Fun game to play and great job! Great little game, well done! It's quite shimmering, was it not designed for the McWill screen? I don't have a McWill screen at the moment. If I can repair my fault Lynx I I could mod it with a new screen. I tested the game only on emulators. Any hint to make it better is welcome.